Leave the babies at home. My yard sale rule for my kids is, if you can buckle yourself in and out of your car seat you can come with me. You'll be making frequent stops, only getting out for a few minutes, you don't want to have to be buckling and unbuckling all morning. One time I had a family stop at my sale and ended up spending about 15 minutes going through my things before they remembered they had left the baby in the car. Don't take any chances, if you can, leave the baby at home. Empty out the car. You may come home with more than you planned for and it's good to have space in your car to bring it all home. Take small bills and quarters. Early in the day sellers might not have change. Look for kids in the yard and the color pink. If you are looking for kid clothing, it's sometimes hard to tell if a seller has any for sale. Keep an eye out for kids in the yard. If you see kids playing in the yard, they probably have kid clothes. If you see an abundance of the color pink, then you know there is girl stuff for sale. If buying multiple items ask the price upfront. 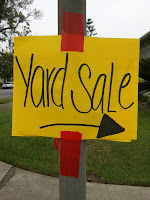 Generally people will sell clothes or other similar items in a pile for a set price. Once you know the price you can gage how many you can afford. Don't waste time sorting through a pile and finding what you want only to find out the seller wants $5 a piece. Check for stains on clothes. If buying baby clothes look for stains on the front where food is likely to dribble, and in between the legs where poop is likely to leak out. Check for worn knees on pants, zipper, buttons, and snaps on shirts. If they are your neighbors, be friendly! There are lots of sales in my neighborhood and I will tell the sellers, "I live up the street", and then compliment them on their yard or mention something about their house that I've noticed on walks with the kids. I've gotten lots of discounts this way and once I got a Little Tykes slide/swing play set that was practically new for $20 instead of the marked $60 sign because I lived on the block. It's okay to haggle a bit. If the sellers want $5 for an item, offer $3 and see what happens. If they won't come down in price try driving by a few hours later. If the item is still there make your offer again, they may be more willing to sell.